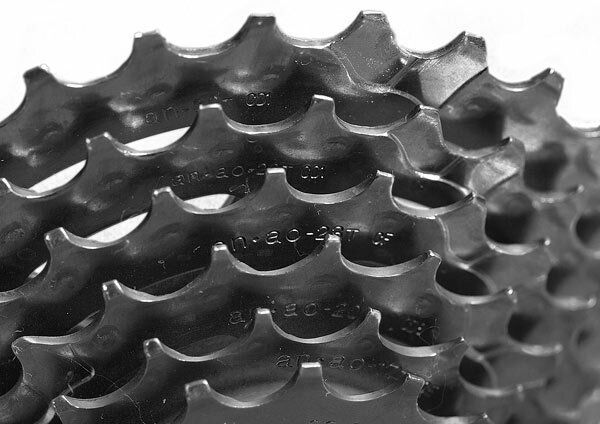 I want to share the experience of bicycle cassette renewal (reboring of rear sprockets). My budgetary bike need for bicycle cassette renewal after about 10 years. Hard to say how much it run, but for the last four seasons it about 10 thousand km, 8.5 thousand of which on the road and 1.5 thousand in the woods. 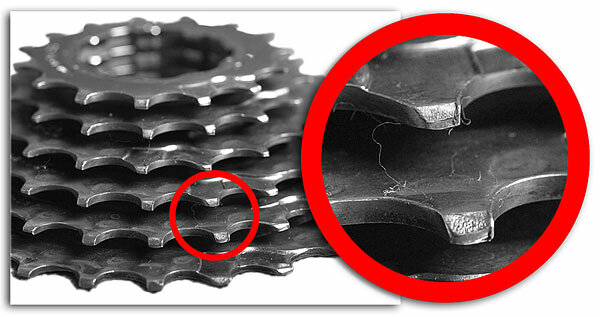 In principle, there is nothing strange in the fact that chain began to slip on the cassette (rear sprockets) under load. But still it happened somehow suddenly. It all started with the fact that on the long uphill of Course for MTB type XCM (marathon) in Alfa-Bitsa (Moscow), the chain began to slip sometimes from a large star of system to the middle one. Conclude from this that the chain is stretched, measured with caliber – indeed it is. For this case I have got reserve, as considered more strong chain, Shimano HG for 6-7-8 sprockets. Cassette is 8-speeds, 11-30 teeth. Normally, I put the chain KMC for 8 speeds, but the last such chains of very low cost from a nearby Decathlon were stretched in the forest quite quickly. With this new chain ride became really bad, the chain slipped, and almost at all rear sprockets. How I read before, in worn cassette chain slips firstly on “favorite star” or 1-2 in the middle. And then this slippage should degrade gradually. That is, it is not as in my case. I noticed a sticker on the big star of “use only a chain Shimano IG”. Digging the Internet showed that the IG is narrower chain, which is the same as KMC 8 speeds, and HG more suitable for speeds 6-7 and in 8 may hit the teeth of neighboring stars. Put back the old stretched chain KMC, all became normal again, again delight with “strong pedal”, the chain was not slipped. I’ve examined the cassette and have not noticed any traces of wear. Just in case I checked online shopping, suspicions were confirmed, such cassette is no longer sell. After all, 10 years have passed, and now 8-speed cassette is on rarity, and a cassette with a biggest sprocket only 30T does not meet. Possible to buy a 36 teeth, but most likely will have to change then and rear derailleur. In Decathlon was not budget chains KMC 8 speeds, so I had to call in the “Sokolniki” and at the same time make sure that no cassettes 11-30T there. 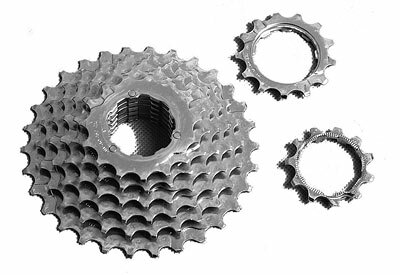 The cassette consists of the “assembly” of 6 sprockets and two separate stars. Cassette looks great, shining nickel, facets are clear. Not so I imagined worn cassette 🙂 This is sprockets with closer view. Ironically, one can say that this is the way it should be. When I’ve studied jerks of chain, it became clear that the roller of chain goes rise from the tooth after only 0.4 mm of space. Therefore, such size worn (rounded tooth) can be difficult to see. 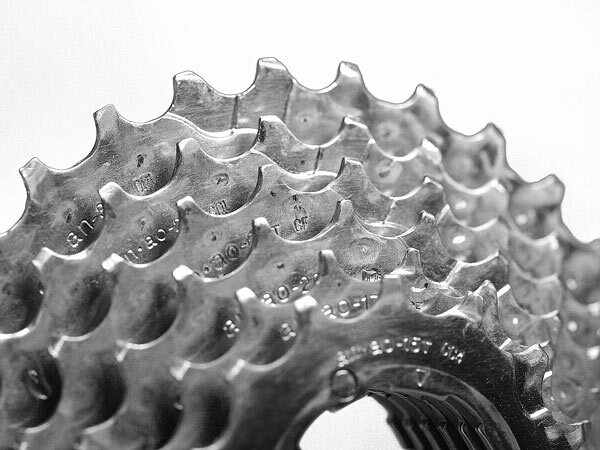 Besides that, chain jumps not at all teeth, and possibly even at one in sprocket. Therefore, it is necessary to find worn tooth. These two look suspicious. There are rivet, which could be formed only by worn out. It is difficult to say whether such a defect is comparable with the size of 0.4 mm. Here a lone tooth among the very good, but with a noticeable rivet. Overall, pleasant enough. If it is called the “wear and tear” cassette, then somewhatwrong in construction of this node. 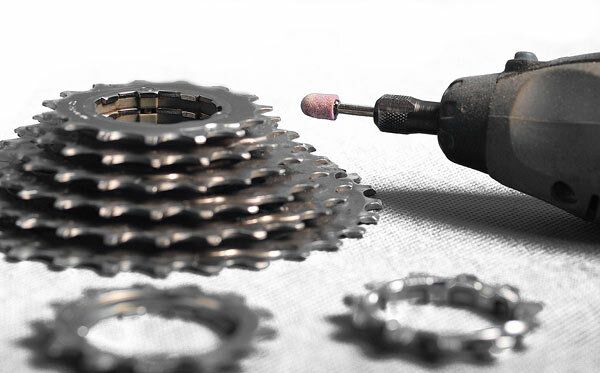 Bicycle cassette renewal with a so little wear is not very difficult. It is necessary to remove rivet and slightly rebore tooth. 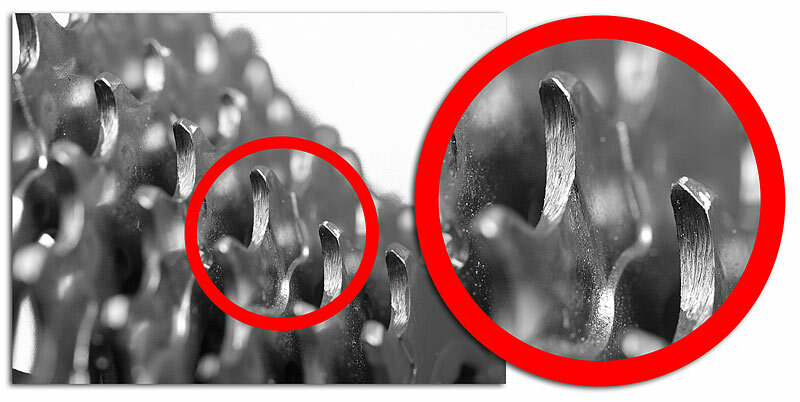 Assume (even it is not seen) that the tip of the working part of the tooth is slightly worn, so it is necessary to make the edge more sharp that the roller of chain cling better. And to make it better at all the teeth, because at look they are all about the same. 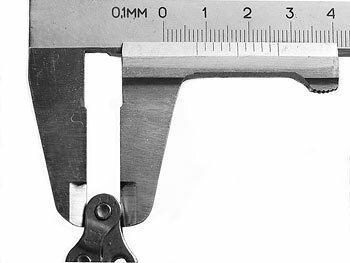 To do this, measure the diameter of the roller chain and take the stone for Dremel about the same size. Then for bicycle cassette renewal go by Dremel on working part of each tooth. It is not long and not difficult.